Please note that you shouldn't wear any valuable jewelry, clothing or shoes when cleaning, around chemicals, or swimming. How to clean your sterling silver beads. Clean your sterling silver jewelry with a Sunshine ® Polishing Cloth or a soft sterling silver cleaning cloth and gently rub off any exceSterling Silver makeup. Remember, silver is a very soft metal and you can scratch it if you aren't careful, so don't rub it too harshly. Store your bracelet in an airtight zip lock bag. Save the one it came in, it works perfectly. This will help prevent some tarnishing. Remember sterling silver is meant to be worn and your body oils also help prevent tarnishing. Do not use liquid jewelry cleaner on your jewelry. To clean away exceSterling Silverive tarnish, clean your sterling with a soft cloth. You may also use a nonabrasive brand name paste silver polish to remove exceSterling Silverive tarnish. A silver cloth is the best way to remove tarnish from jewelry. Be sure the item to be cleaned is free from dust and other abrasives. Note: Liquid silver cleaner will remove the black (tarnish) coloring from the letter blocks and may discolor the beads. 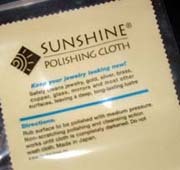 Sunshine ® Polishing Cloths are non-staining and easy-to-use cloths to remove tarnish from sterling silver, gold, braSterling Silver, copper, glaSterling Silver, mirrors and most other surfaces, leaving a deep, long-lasting luster.